Hospital staff are getting into the festive spirit by hosting a Christmas Fayre at Grantham and District Hospital. The fayre, taking place on Saturday, will bring together staff and members of the public to enjoy a cup of tea and a sweet treat while browsing craft stalls and taking part in a raffle. 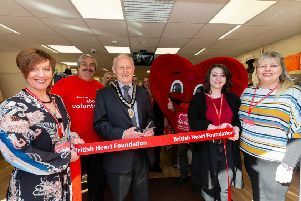 Since the League of Friends started fundraising for the hospital they have raised more than £1,000,000 worth of equipment and items for patients. Most recently this includes new waiting room chairs, an ultrasound laser scanner and children’s toys for A&E as well as chairs which convert into beds. Along with the Mayor of Grantham, Coun Lynda Coutts, who will be opening the fayre, the Grantham Lions Club will be making a special visit on the day with Santa and a sleigh full of present for patients at the hospital. The Christmas Fayre will be held in the Grantham and District Hospital restaurant from 10am to 1pm and everyone is welcome to come along.